Millions of people around the world are affected by flood waters each year. Flooding waterways and flash floods on average are the most damaging natural disasters resulting in millions of dollars in property damage and claim hundreds of lives. Flood waters can slowly advance or occur minutes after rainfall, so it’s essential you are prepared before a flood and know how to act during and after a flooding event. 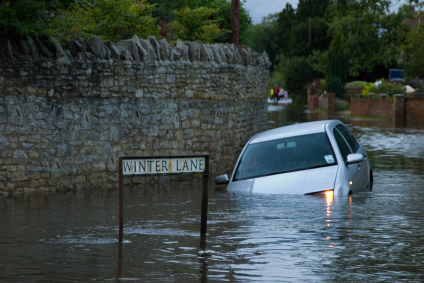 The best way to avoid the devastating effects of flooding is to understand the factors that lead to flooding. Of course rainfall is correlated to flooding but did you know that the local terrain, flood control measures and construction all impact flooding? To decrease the chance of flood waters becoming an issue avoid building your home on a floodplain but be aware that where rain occurs flooding is a possibility. Protect yourself financially from flood damage with flood insurance. Many homeowners are not aware that homeowner’s insurance policies do not cover losses from floods and there is a 30-day waiting period prior to coverage kicking in. Don’t risk large investments- buy flood insurance now! While a flood is happening it’s important to listen to emergency radio broadcasts. Information on flooded areas and evacuation orders will be communicated over the radio. This is especially true if power has been knocked out rendering televisions useless. Move valuable personal items to the second floor of your home if you are not in imminent danger. If you need to evacuate your home make sure you take an emergency kit with 72 hours of food, water, medications and a first aid kit. Most flooding deaths happen while the victim attempts to drive over a flooded road. Do not risk your life as just 2 feet of moving water carries enough power to disable even the largest cars and trucks. Most flooding deaths are due to victim not respecting the power of flood waters. Following a flood, rescue and emergency crews will be busy saving stranded residents so it’s best to make their jobs easier by staying off roads. Don’t risk driving on bridges and roads as they may have become unsafe to traverse. Flood water is usually contaminated so make sure you clean and disinfect anything that came into contact with flood water. Contact your flood insurance agent to discuss claims and check the references of repair contractors before they begin to repair flood damaged property. Local and federal agencies may offer assistance so listen for information on relief programs that will help you recover from a flood. Your life is not worth risking during or after a flood. Respect the power of flooding waters and remember material possessions can be replaced, your loved ones cannot. Losing your lifetime is usually something happens in order to most of us, most of us merely certainly not learn whenever. Along with while it is a abnormal topic you should experience simple fact of computer happening to you sometimes sometime soon. Protecting using a life insurance policy is usually one of the ways involving protecting contrary to the not known as well as guarding all your family economically. If you detect that water damage restoration the structure of your home, the best thing you can do is call a water restoration company immediately. If the integrity of your home’s structure is under attack by water, your safety is also threatened daily. Mitigation offers immediate response for water damage and flooding by a licensed contractor and water damage expert water damage restoration Torrance. It's also good to have flood insurance for when things like this happen, especially if you live in areas that are particularly prone to flooding. Better safe than sorry, I say! It is very difficult to understand and stop the water flow and damage caused by it. Fortunately, we have restoration method to remove the excess of water from unwanted spaces. As the damage caused by flood is most destructive and need to be addressed as soon as possible to minimize losses. In such case we need basement water damage repair company in Queens New York that handle the situation effectively and get back our life in normal state. The nature is unpredictable and nobody can surely forecast regarding the natural calamities. One such natural disaster is flood which not only destroys our property and equipments but also pose danger to the lives with regard to water generated health issues. Floods usually come without any warning, and whenever they come, mostly it has the capacity to cause damage to both life and property. Given that people are not ready to deal with floods until it comes, what one can at least do is do the needful at least after the floods has come. Floods can have annihilating outcomes and can have consequences for the economy, environment and individuals. Broken funnels, climbing water, overflowed cellars, and storm harm. Any number of things can result in water harm to your home or your business area. Hi, Great.. Tutorial is just awesome..It is really helpful for a newbie like me.. I am a regular follower of your blog. Really very informative post you shared here. Kindly keep blogging. If anyone wants to become a Java developer learn from Java Training in Chennai. or learn thru Java Online Training India . Nowadays Java has tons of job opportunities on various vertical industry. The water molecules react with fabric, wood, drywall, and metal and lead to disintegration, oxidation, and mold growth. However, if you act quickly and contact a professional to deal with the flooding, you can restore your home to the way it was before. Thanks for sharing such a great information by you. I love the way you explain on how can recover flood water. If you are looking for Water Damage Restoration Chester PA visit biowashing. digital marketing services cambridge needs to constantly develop if it is going to continue to attract interest. Most organizations aren't simply interested in strikes for their sites but in transforming those strikes in to having to pay clients. I really love your writing. Your information are very helpful to know about how to recover from water damage. Are you looking for Water Damage Restoration Newark DE then visit Biowashing. We changed to normal, earth cleaning and home care items to take out the solid scents that I knew was disturbing the fibromyalgia side effects. And furthermore these colloidal minerals can draw in poisons and overwhelming metals from the body and flush them out. Wow what a Great Information about World Day its exceptionally pleasant educational post. a debt of gratitude is in order for the post. As we all know many of these medications have proven to be quite dangerous, even deadly. Very informative! Over the longest time, I promise myself that I would research companies that could fix my house water damage. Truth is I didn’t have the time, then I stumbled on Super Dry which is a website that finally helped me find the best companies to restore my water damage! burial insurance Applicants are asked about age, smoking history and whether they have serious conditions. Your article is very informative. Flood is a natural disaster. You should prepare yourself to face this problem. The chances of the flood increases in the rainy season. After the heavy rain, if your roof leaks or any other issue generates then you should call for help to water restoration service company. According to Orange County water damage service, the company should have experienced staff and fast service. Fast and outstanding service is essential. Rising water is also a big problem. So water restoration company should the ability to face and remove all the issue of water leakage. Flood leaves huge destruction. Your article is very informative for those who are living in that flood places. Thanks for sharing an interesting article. © 2013 Scientific Sales, Inc. • Powered by Volusion.